Panasonic announced it has developed a desktop „companion“ robot with human-like movements and communication skills. The robot, developed as a proof of concept, debuts at the Panasonic booth (#12908) at CES 2017 in Las Vegas, Nevada, U.S. during Jan 5-8. „This test project builds on Panasonic’s innovations in robotics including battery and power solutions, vision and sensing, navigation solutions and motion control in a new appealing design. This is Panasonic’s latest effort in demonstrating network services in a friendly package, and we are showing this robot at CES as a way of obtaining feedback on its features and functions,“ said Takahiro Iijima, Director, Panasonic Design Strategy Office in North America. The robot is equipped with a Wi-Fi network function that accesses artificial intelligence-based natural language processing technology. This enables it to communicate in a clear, friendly way. The robot is able to access and use cloud data, and commute with those in other locations. Thanks to its embedded projector, the robot can be used for distance learning and other purposes. The robot is about the size of a standard kitchen countertop blender. Panasonic has submitted patent or design registration applications in the U.S. and other parts of the world. 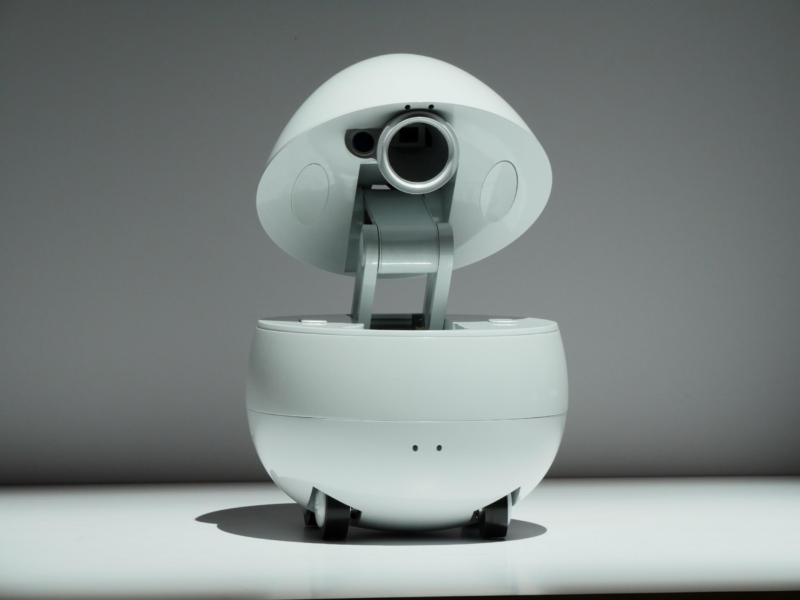 The robot has a cover that looks like an egg shell, which the robot can open to reveal a built-in projector. The robot also moves back and forward, and up and down. Its features and dexterity–designed to mimic human movements–inspires people to interact with it and are made possible with Panasonic-developed servo control technology. The robot’s child-like voice adds to the realism. Its voice and embedded projector work together to deliver natural communication that builds a sense of attachment with its human owner. Dieser Eintrag wurde veröffentlicht in English, General und verschlagwortet mit Desktop companion robot, Egg, Panasonic von Sebastian Trella. Permanenter Link zum Eintrag.